Our upcoming exhibition Tony Fomison: Lost in the Dark, diving into his dark and moody works from 1967 to 1975, is co-created with students from Wellington High School, which involved working together across a number of creative sessions. Here, Experience Designer Chloe Johnston channels her inner teen. What’s cool these days? Is skux still a word? I mean, it’s pretty lit. Or is it on fleek? Us adults can be very uncool trying to keep up with the next generation. So how do you design an exhibition for them? Of course, we have some pretty good hunches. We’ve done our literature reviews. We have first hand experiences to draw on. We have parents of teenagers in the team, and if I’m being honest, it’s less than a decade since I graduated high school myself. But what better way to create something for young people than with young people themselves? In a series of workshops, we sat down with art students from Wellington High School, years 11–13. 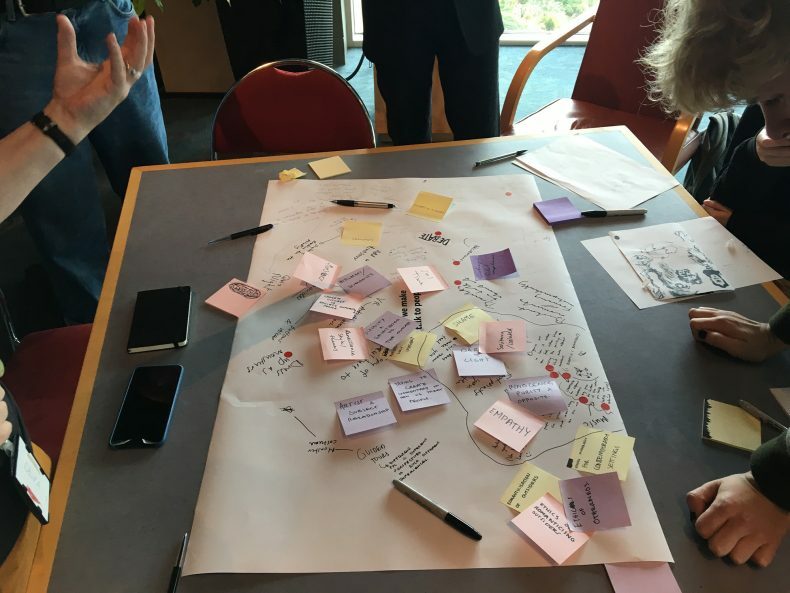 We soon realised this eloquent, self-aware, and engaged group were so eager to work with Te Papa, and bursting with fantastic ideas. Our discussions about gender, identity, and social outcasts were incredibly rich, and challenged our assumptions about the depth of interpretation originally planned for this age group. Our first workshop was all about gathering inspiration. 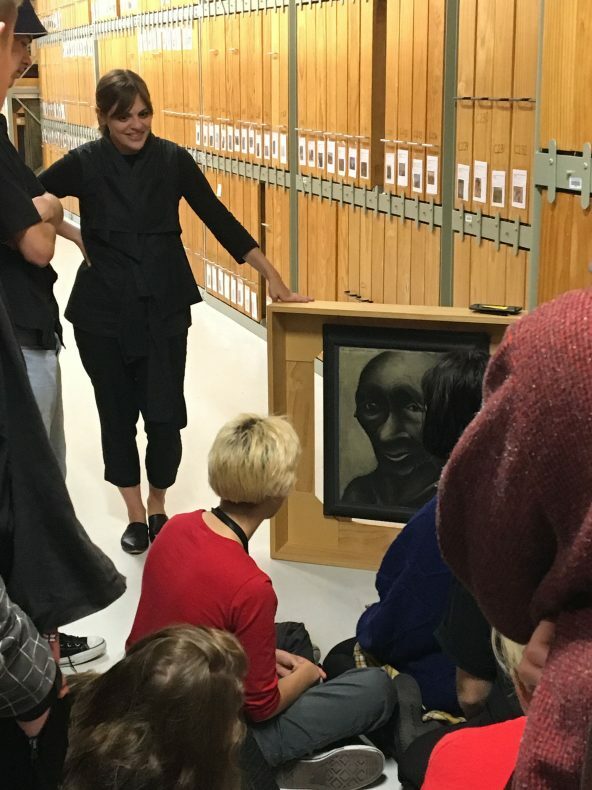 We explored the National Art Collection, with Lead Curator Chelsea giving us a deep dive on artworks in the upcoming show. We talked audience, and set everyone loose through Te Papa’s Toi Art gallery to find different things they loved, their friends might love, and their Grandma would love. As well as things they didn’t love – asking who might it have been created for? This got everything thinking about interpretation and how we design for various audiences. We went a little deeper and talked about how some things were designed for values, regardless of age, too. The following workshop was all about blue sky ideas. We posed the question ‘How might we bring the art to life?’ and fleshed out ideas with break-out discussions around the artist’s themes. Many of the ideas that came out of this session were about enabling visitors to gain empathy for subjects in the artist’s work, allowing people to have moments of self-reflection. Others ideas aimed to facilitate conversations between visitors in the exhibition – the idea of mental health was important (particularly for these artworks), which is something we definitely need to talk about more as a nation. They were eager for the exhibition to provide ways into the conversation, as well as providing information about how to get support. Many also advocated for bringing the art to life in surprising ways – through contemporary dance tours, podcasts, and interviews with real people who are living some of the themes explored in the artworks (like mental health, or addiction). They wanted to hear from people with lived experience and other visitors, rather than from a sole curatorial voice. Diversity and multiple perspectives were important. Programmes and events to support the exhibition were also popular, especially hands-on workshops outside of the Te Papa’s opening hours. Surprisingly, the students are missing our social media marketing for current events – they’d prefer to hear about events through their teachers and arrange with friends on the spot to go or not. Now the design phase starts and it’s our job to manifest their ideas. Many of the groups are continuing to work with us outside of school, pursuing different concepts from the workshops including a physical response space in the exhibition. We feel so lucky to be working with such an inspiring and engaged group. Each session leaves our project team feeling uplifted and energised – this is just the beginning. And in case you wondered, the new exhibition will be ‘so woke’. I can’t help but think how lucky those students were to have the opportunity to work with you! I love how you have inspired and encouraged them to express themselves and at the same time exhibit in the gallery using work from the art collection. Thank you Chloe, this is such a positive thing to do! As one of Te Papa’s old ‘squares’ (over twice the terminal rock and roll age of 30), I cannot hope to vie with your ‘inner teen’, Chloe. But I’ll try!